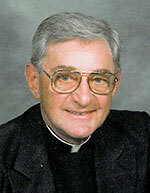 Father Harold Ripperger, a retired archdiocesan priest who answered God’s call to be a priest over a possible career as a major league baseball player, died on June 8 in his residence at Guerin Woods in Georgetown. He was 80. The Mass of Christian Burial was celebrated on June 12 at St. Mary Church in Lanesville, where he previously served as pastor for nearly 20 years. Archbishop Joseph W. Tobin was the principal celebrant of the Mass. Burial followed in the cemetery at St. Mary Parish in Lanesville. Father Ripperger also had a wonderful combination of “an absolutely fun, dry sense of humor” and “a holy, reverent style” that led people to want to serve the parish and the Church, Lynch noted. “I credit him with getting me out of the pew and into doing something for the parish,” Lynch said. Early in his life, Father Ripperger turned to God in prayer to help him make a decision that shaped his future forever. Home from the seminary for the summer when he was 19, he sat in his parents’ house and listened as a Major League Baseball scout made him the most tempting offer he had ever heard. The scout told Ripperger that he had seen him play baseball in Richmond that summer, and Detroit Tigers officials were interested in talking to him about becoming a professional baseball player. The more the scout talked, the more the idea appealed to him. He could play the sport he loved, maybe get married and have children, and even possibly get rich pursuing one of his childhood dreams. Yet, there was also this other childhood dream he had. Ever since he was in the seventh grade, he thought about becoming a priest. Torn about what to do, he prayed to God—and continued his path toward the priesthood. His older brother, Father William Ripperger, recalls the choice his younger sibling had to make. Most of all, he remembers his brother’s devotion to God and the Church. As a priest who enjoyed a round of golf, Father Harold Ripperger played well enough through the years to have a handicap of three. At the same time, his spirit of generosity didn’t have any limitations, according to another longtime friend. Harold Aloysius Ripperger was born on July 12, 1932, to William and Hilda (Wissel) Ripperger, and was baptized at St. Peter Parish in Franklin County. In his 2008 interview with The Criterion, he talked about his parents’ desire for one of their six sons to become a priest. He also mentioned his mother and father—the parents of eight children—in the context of his favorite piece of writing. When his family lived on a farm, he attended St. Peter School in Franklin County and later St. Michael School in Brookville. After his family moved to Richmond, he finished his grade school education at St. Andrew School. He then graduated from the former St. Meinrad High School in St. Meinrad in 1950. He earned a bachelor’s degree in philosophy at Saint Meinrad College and School of Theology in St. Meinrad in 1958. He was ordained to the priesthood by Archbishop Paul C. Schulte on May 3, 1958, at Saint Meinrad’s Archabbey Church of Our Lady of Einsiedeln in St. Meinrad. He celebrated his first holy Mass on May 4, 1958, at St. Andrew Church in Richmond. Father Ripperger received his first parish assignment on May 20, 1958, as associate pastor of St. Mary Parish in New Albany. On June 19, 1959, he was also named an instructor at Our Lady of Providence Jr./Sr. High School in Clarksville while continuing his role as associate pastor at St. Mary. Seven years later, on Jan. 24, 1966, he was appointed associate pastor of St. Andrew the Apostle Parish in Indianapolis and an instructor at Father Thomas Scecina Memorial High School in Indianapolis. On May 23, 1967, he was assigned as associate pastor of St. Michael the Archangel Parish in Indianapolis. He became the associate pastor of St. Mary Parish in Greensburg on Sept. 7, 1970. Father Ripperger was named to his first pastorate on July 5, 1973, at St. Mary of the Immaculate Conception Parish in Aurora. Ten years later, on July 6, 1983, he became pastor of St. Rose of Lima Parish in Franklin. On July 2, 1986, he was appointed as pastor of Holy Guardian Angels Parish in Cedar Grove and St. Joseph Parish in St. Leon. Three years later, on July 5, 1989, he became pastor of St. Mary Parish in Lanesville, where he served until his retirement on July 1, 2009. Reflecting on his priesthood, Father Ripperger said, “It’s just been a rewarding life. I’ve had good health, and I’ve had a lot of support from parishioners wherever I went.